Jerri here from A Bushel and a Hug. I hope you are having a fantastic week. Today I am sharing a card that I made for the Technique Junkies Design Blog using two of the new July Release Stamps. 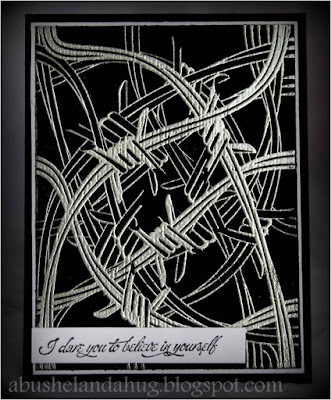 Barbed Wire #S611 is the featured stamp on this card. As soon as I saw it, I knew I wanted to emboss it with silver on a black background. I think it turned out both beautiful and masculine. The sentiment stamp is called Believe in Yourself #SD645. I used my Static Puff Pillow on a black piece of cardstock, Make sure to cover it well with the puff, as you don't want stray pieces of silver showing up on the black background. Using a Versamark Ink Pad, stamp the Barbed Wire onto the black cardstock. Sprinkle Silver embossing powder over the stamped image and then shake off excess. 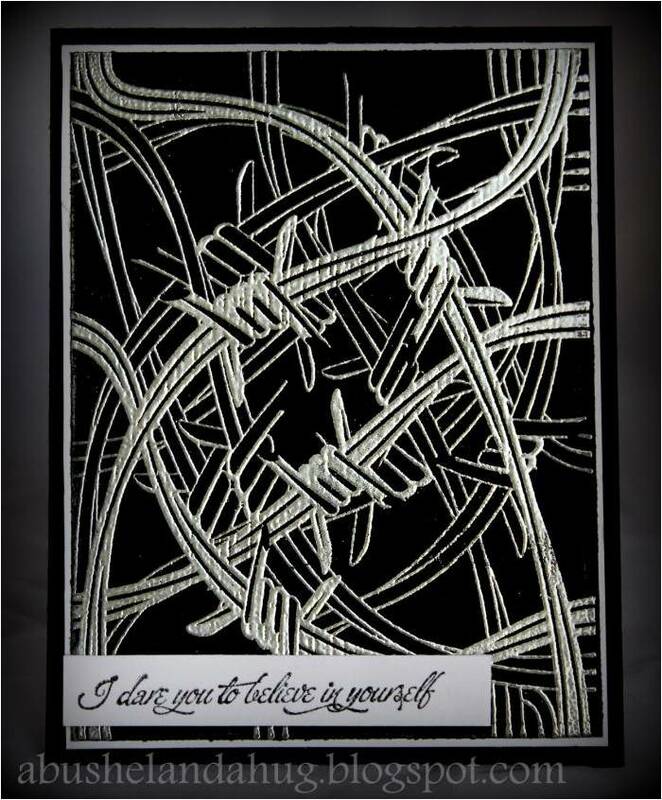 Stamp Believe in Yourself #SD645 onto a piece of white cardstock in black ink. Sprinkle sentiment with clear embossing powder, shake off excess. Heat the sentiment until powder has melted. Trim both of the stamped images with your paper trimmer. Matt the Barbed Wire image with white paper and then again with a piece of black cardstock as shown above. Adhere the trimmed sentiment to the front of the card using pop dots or foam tape. This card is super easy, super fast and I think would work well for a man or woman. Easy and Versatile!! Thank you for letting me share my card with you today.